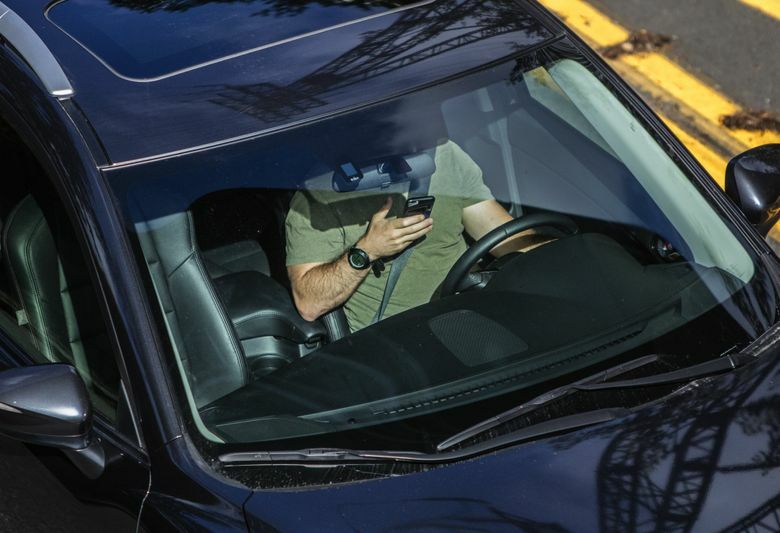 The Legislature has approved a distracted-driving bill that cracks down on using a handheld device while behind the wheel. But if signed by Gov. Jay Inslee, it won’t go into effect until 2019. Lawmakers have approved a crackdown on driving while using a handheld device — but it won’t take effect until 2019. The final version passed Wednesday pushed the proposed start date from Jan. 1, 2018, to Jan. 1, 2019, because several members wanted extra time for the public to adjust, according to prime sponsor Rep. Jessyn Farrell, D-Seattle. In return, she managed to make distracted driving reportable to insurance companies, on the first offense, so they can raise rates as with any other moving violation. This consequence seemed punitive to some lawmakers, who wanted to wait until at least a second offense. Farrell justified the wait on Wednesday, saying colleagues in both parties sought more time for a sustained education campaign, for the public to adapt, and for motorists to obtain built-in communication systems. The State Patrol is currently understaffed but is striving to boost recruitment, with help from proposed raises this legislative session. Senate Bill 5289, also called the Driving Under the Influence of Electronics Act, still requires a signature by Gov. Jay Inslee. It forbids use of a handheld device, and all video watching, while a car is either moving or briefly stopped. The standard traffic fine of $136 would increase to about $245 on the second offense. Current law bans texting and a cellphone chat at the ear, but that leaves social-media, streaming video and many other dangerous uses legal. Motorists will be allowed “minimal use of a finger to activate, deactivate, or initiate a function of the device,” such as to launch a navigation app while a smartphone is mounted in a dashboard cradle. Another clause would fine drivers an extra $30 for other kinds of distraction, such as eating or grooming, as a secondary offense, when law-enforcement officers stop somebody for a moving violation. The vote count was 61-36 in the House and 39-10 in the Senate. Opponents argued that electronics bans target a technology instead of a driver’s actual violations, or that this bill opens the door for further government intrusion. The National Safety Council has called for stronger steps such as a ban on hands-free, built-in telephones. The just-passed Washington state bill was sponsored in the Senate by Ann Rivers, R-La Center. Transportation committees this winter heard painful testimony by victims’ families. Gina Bagnariol-Benavidessaid she doesn’t like waiting an extra year but considers the vote a win, if the 2019 start helps make the education and enforcement more effective. Her sister, Jody Bagnariol, of Hillsboro, Ore., and friend Elisabeth Rudolph, of Seattle, died last year in a rear-end crash, when the driver behind was being photographed by her husband in a selfie on southbound I-5 near Napavine. No felony charge was filed. “I just think this is common sense, and it will save many lives,” Bagnariol-Benavides said. In 2015 there were 171 fatalities blamed on various sorts of distraction, accounting for one-third of all road deaths in the state. Scientific studies have found that using an electronic device impairs reaction time as badly as driving drunk. Farrell said she’s happy with the outcome. Previous campaigns for seat-belt use, and to reduce drunken driving, developed over many years, she said.